Freitag J, Berod L, Kamradt T, Sparwasser T.
A continuous increase in the prevalence of autoimmune diseases is to be expected in the aging societies world-wide. Autoimmune disorders not only cause severe disability and chronic pain, but also lead to considerable socio-economic costs. Given that current treatment options are not curative, have substantial side effects and a high percentage of non-responders, innovative options to the existing therapeutic armament against autoimmune diseases are urgently required. Accumulating evidence suggests that changes in the metabolism of immune cells are associated with and contribute to the pathogenesis of autoimmunity. Additionally, some autoimmune diseases share alterations in metabolic pathways, key metabolites or metabolic byproducts such as reactive oxygen species. Other examples for metabolic changes in autoimmune settings include modifications in amino acid and cholesterol levels or glucose catabolism. Thus, the emerging field of immunometabolism may hold the potential to discover new therapeutic targets. Here, we discuss recent findings describing metabolic changes in autoimmune arthritis, multiple sclerosis. Mounting an immune response requires changes to metabolic processes (i.e. the chemical transformations that are needed for survival). Immune cells have different metabolic requirements depending on their activation state (in order to meet the demands of the activation state) and differentiation state (into effector T cells, which include helper, cytotoxic or regulatory T cells). 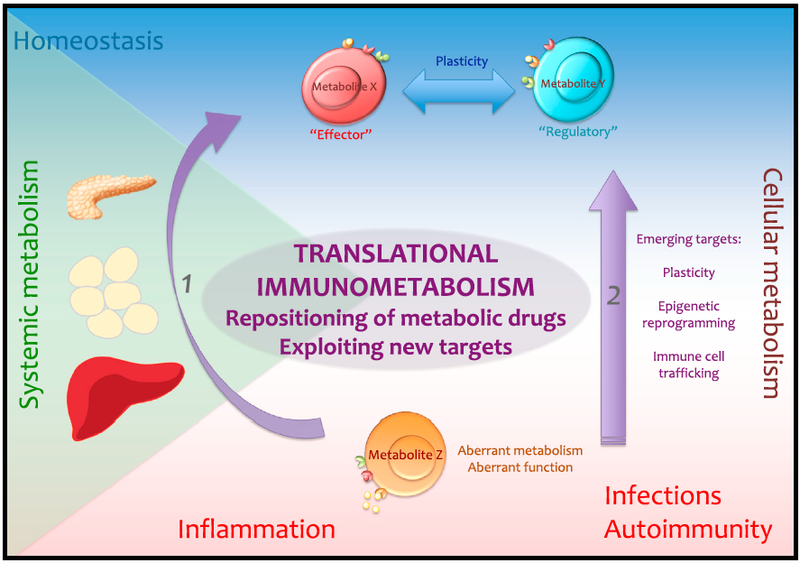 Points of metabolic dysregulation in immune function may prove to be therapeutic targets of the future. For example, the natural antioxidant from the green tea plant, EGCG has been shown to promote suppressive Treg cells whilst inhibiting Th1/Th17 formation (proinflammatory cells). This is currently being evaluated in a clinical trial in MS (Sunphenon in progressive forms of multiple sclerosis, NCT00799890). Leptin is another. Also popularly known as the anti-obesity hormone, leptin has been found to promote CD4 T cell expansion as well as secretion of proinflammatory molecules, such as TNFalpha. Levels of leptin have been sound to be elevated in MS, leading to activation of leptin-mTOR pathway in suppressive Treg cells and as a consequence their impaired expansion. For therapeutic purposes rapamycin-mediated blockade of mTOR activation facilitates Treg expansion and significantly ameliorates EAE (the murine version of MS). Current clinical trials in MS are NCT00228397 (Temsirolimus) and NCT00095329 (Sirolimus). Statins which lower cholesterol have been proven to be beneficial in MS by inhibiting the formation of proinflammatory Th1 and Th17 responses but favouring Treg responses. In fact the MS-STAT (NCT00647348) showed benefits with regard to brain atrophy measures in SPMS. These therapeutic targets may therefore prove to be highly attractive options in the near future. I've got stopped having statins (low dosage=5 mg) because my psoriasis got so much worse. while taking them – it really destroyed my skin. Now that I stopped the skin starts going back to normal. Very intriguing this study NDG. For years I took green tea, I stopped for a while and was just when MS came, but I had also IM. My family for example has a history of cardiovascular disease and 01 cases of type 2 diabetes. Was the metabolism of immune cells connected to more phenotypes considered progressive MS, or would also be directly connected to RRMS? At the moment the evidence is in immune activation states, as far as I'm aware there is always some form of immune activation throughout MS, whether RRMS or SPMS or PPMS. The metabolic states should remain unchanged.